Goat cheese. Love the stuff. Can’t get enough of it. In salads, stuffed in chicken, you name it, I’m all about it. So you can pretty much bet I’m a little excited for goat cheese in light, crisp, buttery pastry. 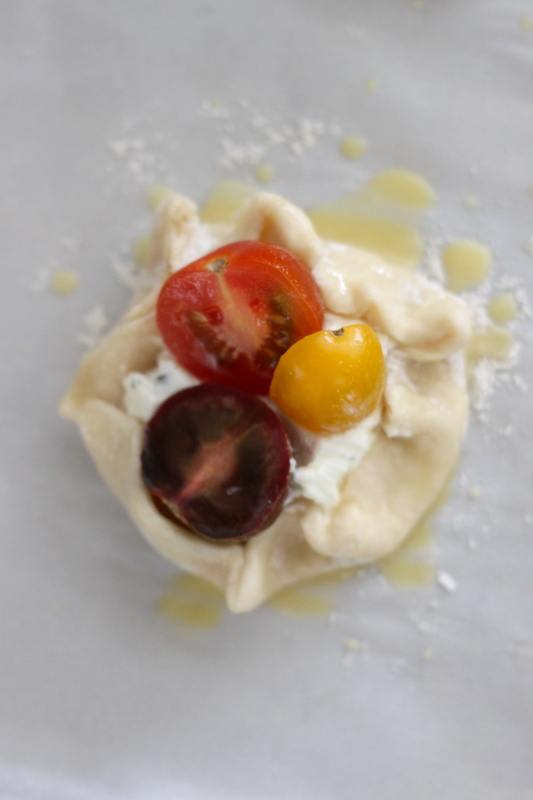 Not to mention the intense, sweet flavor of the tomatoes coupled with the savory flavor of garlic. Uh, yum! If you’ve read my blog for any length of time, you know I love versatile recipes. I love being able to swap out ingredients to create something slightly varied. 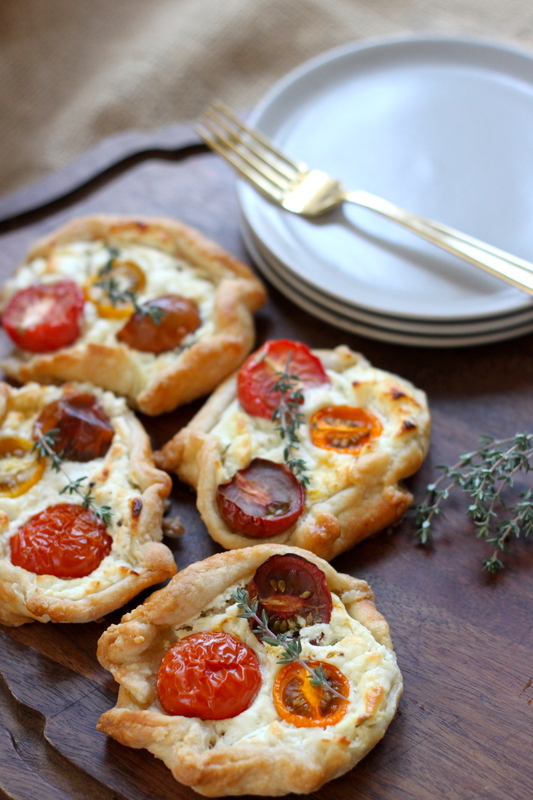 In line with that, these crostata are also so versatile – make them smaller for bite size appetizers or make a large one and slice it up for your guests. The ones featured are perfect for a plated starter by itself or on a bed of greens. Before I let you go, I’ve got to mention my sour cream pastry. So, so easy to make and the result is light, crispy, buttery, amazing. It’s pastry for those who believe pastry is complicated or only for those who, like, know how to cook. This is pastry for the masses. It will make you look like a culinary rockstar. 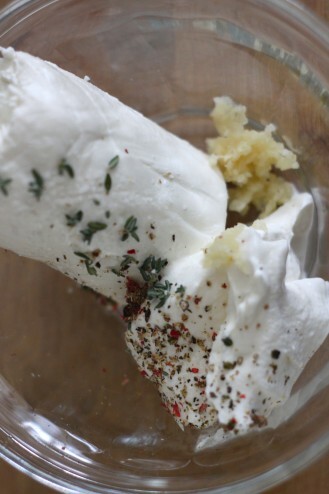 Goat cheese. Love the stuff. Can’t get enough of it. In salads, stuffed in chicken, you name it, I’m all about it. 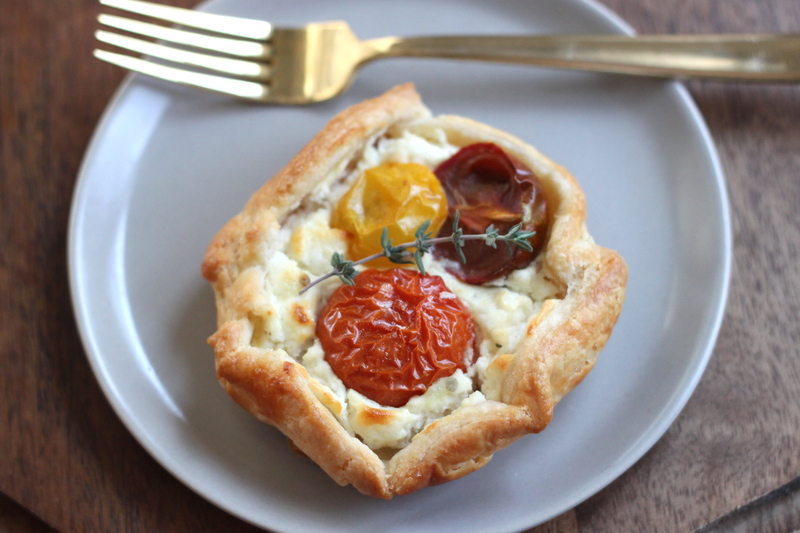 So you can pretty much bet I’m a little excited for goat cheese in light, crisp, buttery pastry. 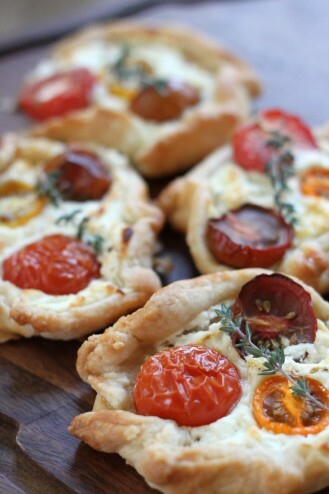 Not to mention the intense, sweet flavor of the tomatoes coupled with the savoury flavor of garlic. Uh, yum! Before I let you go, I’ve got to mention my sour cream pastry. So, so easy to make and the result is light, crispy, buttery, amazing. 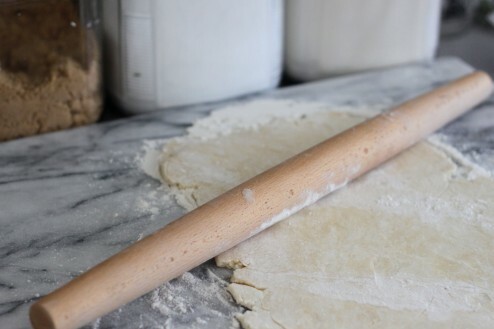 It’s pastry for those who believe pastry is complicated or only for those who, like, know how to cook. This is pastry for the masses. It will make you look like a culinary rockstar. 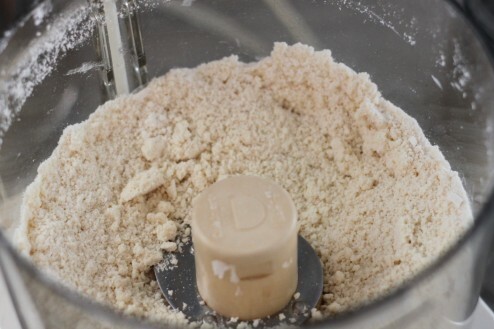 Add flour and butter cubes to a food processor and pulse until a coarse crumble. 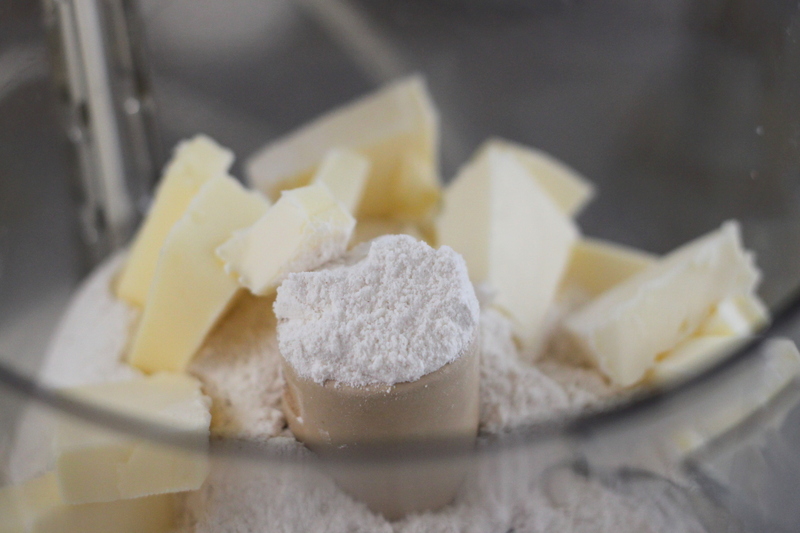 Add sour cream in teaspoon increments pulsing 3 -5 times until dough just comes together in a ball. 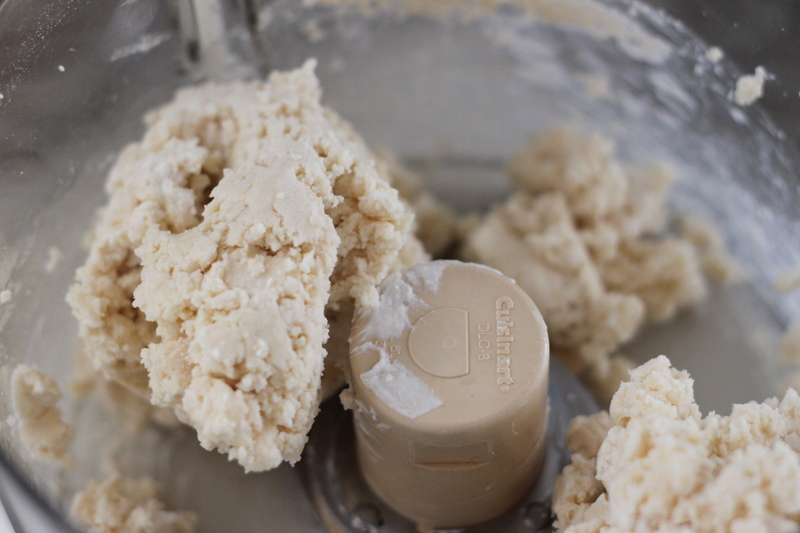 Remove pastry and place on a plastic wrap sheet and press down slightly so a disk forms. Place refrigerator for 20-40 minutes. Meanwhile in a medium bowl, add goat cheese, sour cream, garlic and thyme and mix together with a fork. Next, slice tomatoes and set aside. Prepare egg wash by combining one egg and 1 tablespoon of water, whisking together until well combined. Heat oven to 425 degrees. 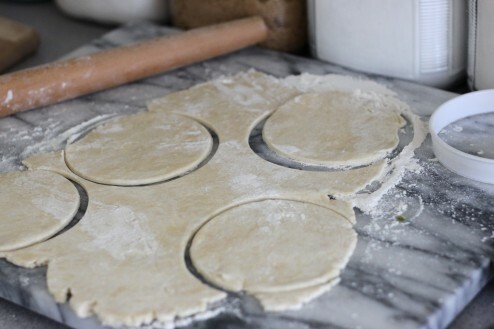 Roll dough out until you can just get 6, 5 inch rounds cut out. Place on a parchment lined baking sheet. 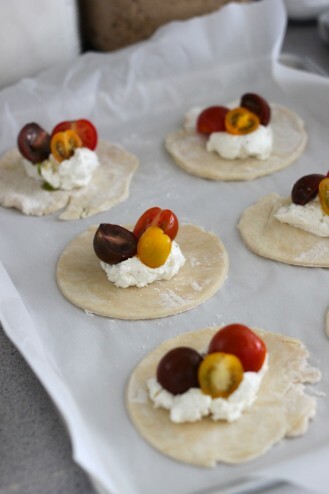 Working quickly, place a cookie scoop sized dollop of goat cheese in the center of each round. 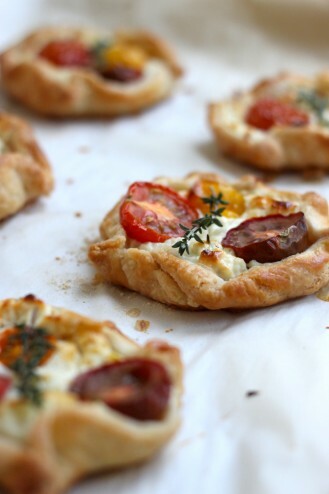 Place 3 tomato halves on top of the cheese and gently fold outside edges of pastry up, making additional folds to hold cheese and tomatoes in. With a pastry brush, gently wash pastry with the egg. Place in oven for 20 - 25 minutes until pastry is crispy and golden. 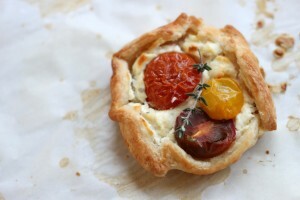 Turn broiler on high and place crostata under for 3 - 5 minutes, to blister tomatoes and gain additional color but being careful not to burn them. Remove and let cool on a rack. Place on a serving platter, garnish and serve immediately.